Two for the price of one. I'll miss all the Friday finishes, but will check in with you over the summer. All these lovely Heather Ross prints add up to a GORGEOUS quilt -- and two of them?? Double score! These are both just so fun!!! Love them!!! They're both beautiful! Congrats on getting them finished :) Enjoy your break over the summer! Thank you for hosting this event for such a long time. It has been a lot of fun. You are a good example of striving for that all-important balance between work and family life. Hope you all have an incredible summer. I can't really believe that my daughter (youngest of four) will be a high school senior next year. I plan to spend time with her this summer as there won't be many more summers where she will be living at home. Keep in touch and post your amazing projects when you ca!! 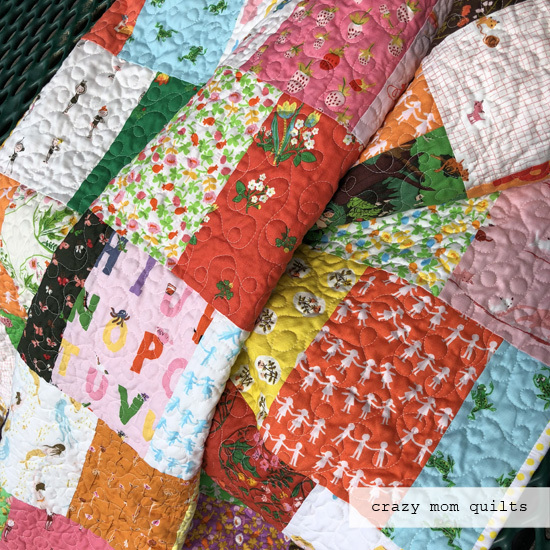 Love todays quilts - so bright and happy looking! Relax and have a great summer! Thank you so much for 7 years of amazing finishes and sharing. I appreciate all that you do, and I hope that you have a wonderful summer with your family. 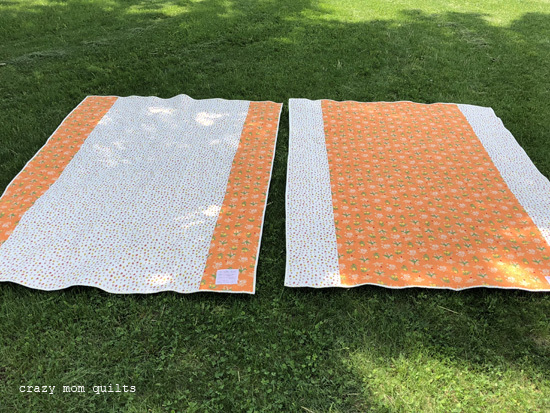 Your quilts are both adorable, I really dig the unexpected light colored binding, and using the striped "lined paper" fabric for a simple inked quilt label is just genius -- it's the perfect finishing touch to complement these quilts. Congratulations!! 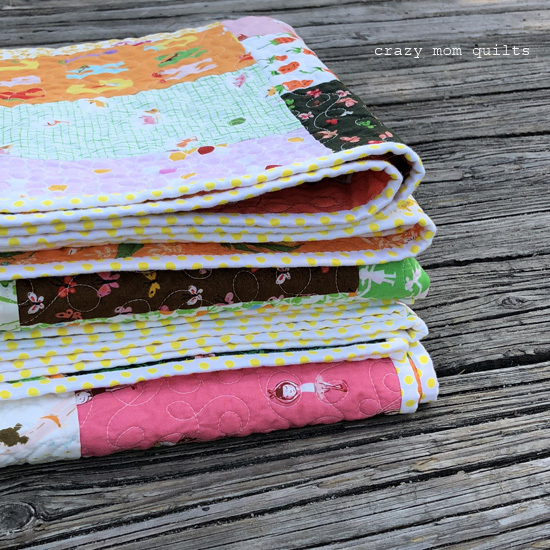 I'll miss your linky party this summer, especially since I was hoping to be able to finish up MORE projects now that many of my other commitments are on hiatus. Your kids must be younger than my teenagers, whom I don't expect to see much of this summer now that they and their friends are driving (yikes!!). Enjoy a wonderful summer with your family! Oh Wow Wee! Lovely Lovely! seriously so very awesome both quilt! You are amazing! That is a long time for finish it up! I had no idea, but I do know that I have read everyone! :) Your labeling has inspired me...I sold a baby quilt yesterday and had the buyer help me with making a label! ha...family friend. Have a good summer! 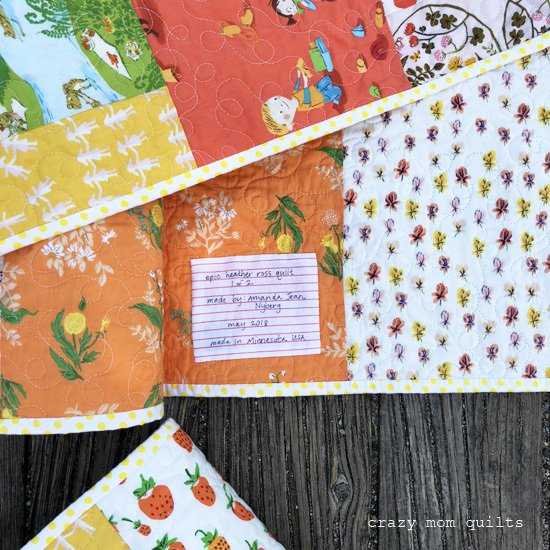 I have had your Easy As Pie pattern on my radar for a bit now...Now I really want to make it! It great in the colors here. I wonder if I could do a fabric pull from my stash?? Maybe if I stick with a theme. Patriotic, Christmas, Fall! Have a great summer and I hope you are back when the kids are back in school and your life returns to structured. Enjoy them, time goes too fast!! Love your two quilts -- your friend is pretty lucky :-) Have a wonderful summer with your family! Thanks for your dedication to Finish It Up Friday and letting us link up with you each week. Enjoy the summer, and that bottom picture is great! Beautiful colors! As always-great finishes. Enjoy your summer and your kids. Enjoy your kiddos! Summer is a great time to cut back on work and enjoy the beautiful weather with your children. We teachers know about this, so trust me. We'll miss you, though! beautiful quilt for summer! By the way, what do you suggest as batting for summer quilt? We have a very humid summer here in Northeast India. Thank you so much for all the Finish Up Fridays. You are an inspiration in so many ways. I hope you have a glorious summer with your children and that we still see your work from time to time when you're ready. Thank you for finishing up our Fridays for 7 years now! Your quilts are wonderful. Brilliant to make 2 at once. Have a great summer! WOW! 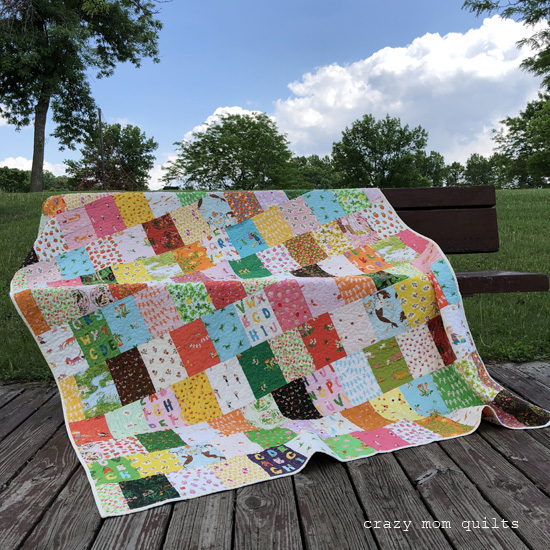 These quilts are so fun and gorgeous! The fabrics are great and the backings are too perfect! The binding takes the cake! I hope you enjoy your summer immensely! You and your family deserve it! Thanks for all you do!!! 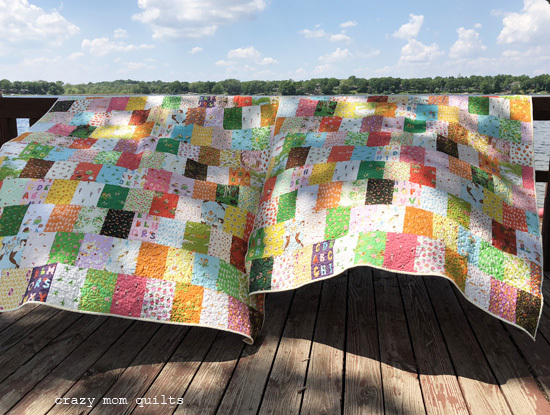 Love this quilt, looks to be "Easy Enough for Laura" to work on over summer while you are playing with the kids! You'll be missed, but enjoy your time away from the computer! Those are two super cute quilts. Enjoy your FIUF break!! so many finishes - wow, didn't realize how long you've been running finish it up fridays! thank you! it's always fun to link up and check out all the other finishes too. Definitely spend time having Summer fun - and I'll hope to link back up fridays in the fall! Great way to show off those cute fabrics. 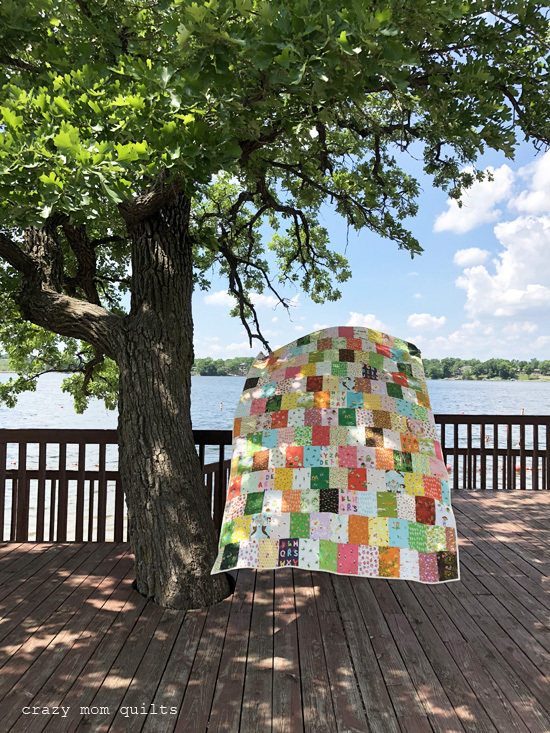 The finished quilts are wonderful, blowing in the breeze! Wow, Amanda! Two amazing finishes! Thank you for running Finish It Up Friday, you’re a real inspiration! Have a lovely holiday, but I can’t wait till you return! These are so fabulous, Amanda Jean! Love. Them. Hope you enjoy your summer break. It is great to be able to spend time with your family. Kids grow up so fast. 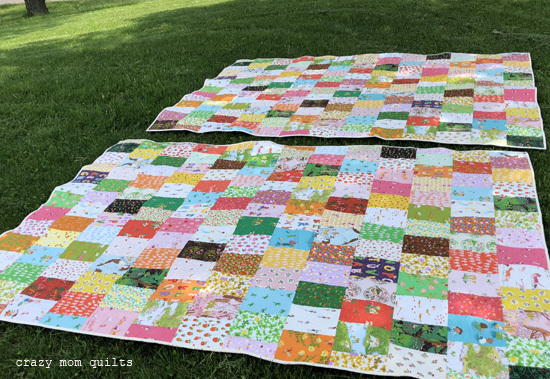 Thanks for hosting and I love your twin quilts! They are so sweet! As always, you’re an inspiration to me. Have a wonderful family summer and thanks for running the linky party with so much dedication for so long. I really like that! I have tons of novelty prints I need to use up, and this pattern would be perfect. Yup - creamsicles.